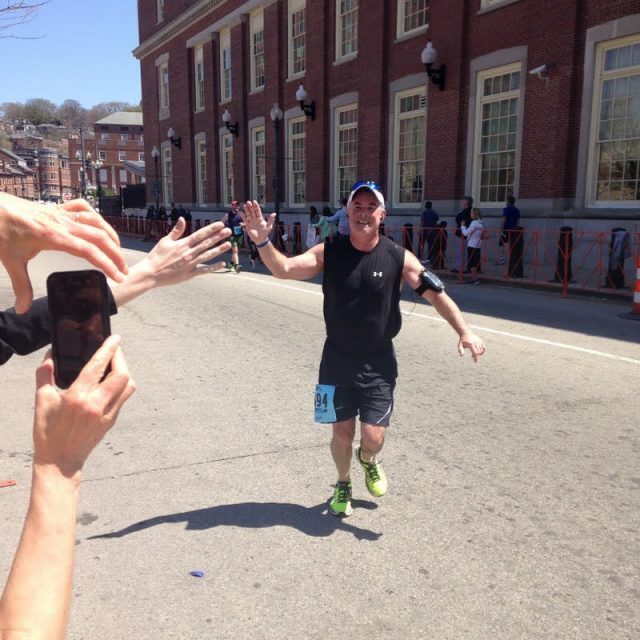 Mark high-fiving friends and family during a marathon run in Providence, Rhode Island. Just after his 40th birthday, HeartShare Board Member Mark Healy agreed to join his wife in a triathlon. Reluctant at first, he trained and pushed through to the finish line—and thoroughly enjoyed it. His wife suggested they try the New York City Marathon that coming year. Thinking there would be a very slim chance that both of them would be chosen, Mark agreed. Lo and behold, a few months later, his wife surprised him with the news–they had both been chosen and would be running together. They began training. Just after they started training, 9/11 happened. Everything changed in one day and city-wide events were cancelled. Mark and his wife didn’t know whether to continue or stop training. The event was in limbo. The city decided to move forward. It was the first major event in the City since the falling of the towers. Running in support of the victims and others affected by the attack was very meaningful to Mark. “The emotion that day was indescribable. As we were running, we were high fiving firefighters and children. It was incredible.” Mark was deeply inspired by this experience and wanted to continue running marathons with the goal of making it to 10. So far, Mark has run 5 New York City Marathons, 2 Boston Marathons, and 3 Marathons in Providence, Road Island. Just when he thought the post-9/11 Marathon was the experience of a lifetime, Mark happened to be running in the Boston Marathon in 2013 when a bomb went off. He was about 2 blocks away when the second bomb went off and had no idea what was happening. Without any information, Mark and other runners saw pedestrians running the other way. The police directed all the runners to an undisclosed place. They had no water, no phones, and no idea what had happened. Finally, someone got word that two bombs had gone off near the finish line. Mark was in a panic because his wife was supposed to be waiting for him there. He had no way of reaching her and was unable to leave the area. When the runners were finally released, Mark left to find his wife. Looking all over, Mark finally found her; she had showed up late and was unable to stand near the finish line. Luckily, she was completely unharmed. Click here to donate to Mark’s page.